In an earlier post, I wrote about how NBC had hired a Chickasaw man to rework the "Ugg-A-Wugg" song, replacing that phrase with a word used by the Wyandott people. Other musical changes were made, too, he said. That song was replaced with a new one, called True Blood Brothers. NBC's live production of Peter Pan aired last night (December 4, 2014). 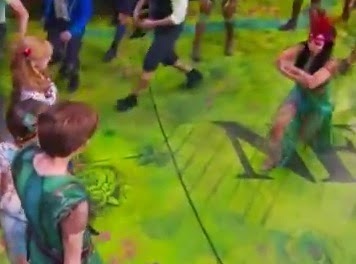 As Tiger Lily stands before Peter Pan for this song, she says something like "O a hay" instead of Ugg a wugg. The music that plays during this song? Classic Hollywood fakery. Below are some screen captures from the video available on YouTube. At the very bottom is the video itself. Everyone dances to that Hollywood Indian music, and then John and Michael start singing "Hickory Dickory Dock" (rather than O-a-hay o-a-hay o-a-hay). They're pretending to be Indians at that point. See that blue feather? And that loin-cloth-thingy? More Hollywood Indian music, more dancing, a dummy meant to be Captain Hook, and the number ends with Tiger Lily and Peter Pan singing they'll be blood brothers to the end. As I watched the clip, I didn't see any Indian women. Just Tiger Lily. All the rest of her "tribe" are men. "O-a-hey" is supposed to be a Wyandotte word. Does that make this all better? No. Not at all. I wonder how many kids are at school today singing "o-a-hey o-a-hey o-a-hey" as they prance about with their arms crossed? I wonder about the Native kids at school today. Are they looking at their peers doing this silly song and dance? Did you tune in? It is getting slammed by reviewers this morning. What do you think about it? As requested by Rebecca (in comment section to this post), I'll add critiques of the Native content. 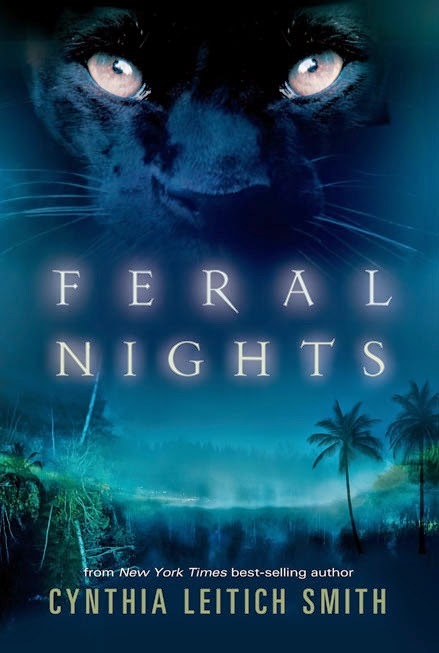 The protagonist of Cynthia Leitich Smith's Feral Curse is named Kayla. Her parents are white. She is black. She was adopted. From Ethiopia. There's more. Lots more. And though it might seem like a lot for any story to take on, Smith pulls it off. Kayla is a senior in high school. She is dating a guy named Ben. He's white, and deeply religious. Shifters aren't magical or demonic. Many of the Lord's creatures can transform. Frogs can change their gender. Snakes can change their skins. So what if we can change on the cellular level? Creation is ever the more glorious for its variety. Ever more miraculous. Isn't that cool? People in the world Kayla lives in know about shapeshifters. She's going to meet other shapeshifters in this story. That's cool, too. Some people don't like them. Others don't know what to do about them. And others don't care. But that's changing, and not in a good way for the shapeshifters. Among Kayla's friends is a girl named Jess Bigheart. Jess is Osage. The two girls were best friends for awhile. Kayla went to powwows with Jess and her family, had sleepovers, all that good stuff. That was before Kayla knew she was a shapeshifter. She was thirteen when she first experienced a shift in her body. It scared her and she withdrew from friendships, becoming somewhat of a loner. Jess, though, remains a steadfast friend. That's going to matter. A lot. Reviews note that the end of the book is a cliffhanger. It is. And it makes me want to read the next one right away, but I'll have to wait. I will say this about that ending. I like anything--well-written, of course--that takes me to Indian Country, because it reflects a segment of society that isn't often seen out there in the land of children's and young adult books. 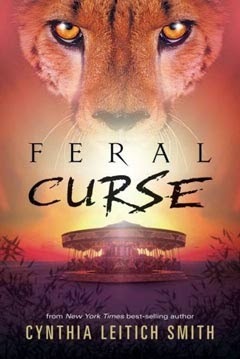 Published in 2014 by Candlewick Press, Feral Curse is the second book in Smith's "Feral" series. Here's the cover of the first one. I wonder what the third will be?! Can't wait! Some months back, I recommended Arigon Starr's comic about the Choctaw Code Talkers. Both Starr and Boney tell us a lot about the servicemen Americans know as the Code Talkers. Hopefully, readers of AICL have seen recent media coverage of code talkers. 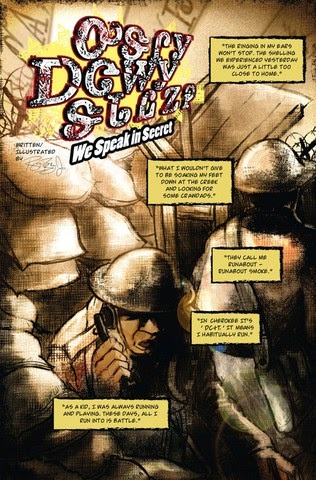 In their respective comics, Starr and Boney, tell us who the code talkers were, as young people in the wars in which they served. The first page of Boney's story tells us a lot about his character. His name, written using the Cherokee syllabary is ᎠᏟᏐᎢ. * Mr. Boney told me it is pronounced ah-thlee-so-ee. ᎠᏟᏐᎢ thinks about his childhood, playing with his friends. He wants to soak his feet in the creek where he caught crawdads. He tells us his name in Cherokee, and that it means "I habitually run." Some fellow soldiers call him Runabout Smoke. He talks about stereotypes and how they shape the way some soldiers interact with him. One calls him "chief" and tells him that they won't be using "smoke signals" on the battlefield. For the most part, they call him Runny. He isn't keen on that name either, but in the midst of a war, he let such things slide off his back in order to stay alive. In his group is a Cherokee from North Carolina who is going by the name of Moses Mouse. He, too, speaks Cherokee. Boney uses a sepia tone on some pages, to show us his character's childhood. On one, he's a six-year-old in Indian Territory, listening to his dad and uncle talk about how their mother, a full blood Cherokee, was declared incompetent, thereby making it possible for land grabs to take place. These land grabs were part of the US government efforts to dissolve Native Nations through the Dawes Act. His uncle says "Allotment. Fancy word for stealin'." The heart of We Speak in Secret is about how the Cherokee language came to be used for transmissions. The Germans were intercepting communications and able to figure out where to direct their bombs. At one point, Runny's group is hit pretty hard. He looks for Moses, calling to him in Cherokee. Moses responds, also in Cherokee. Dauber, their sergeant, is already digging Moses out of the debris and hears the two men speaking in Cherokee to each other. Of course, he doesn't understand them. The two Cherokee men realize that they can use Cherokee for transmissions. Thereafter, "Using our language proved to be a winning strategy. We confounded the enemy." Boney's story concludes by telling readers that "U.S. Public Law 110-420 states that the Code Talkers, first reported in use October 17, 1918, deserve immediate recognition for their dedication and valor." On November 30, 2013, the U.S. Congress honored Code Talkers with the Congressional Gold Medal. The Cherokee Phoenix (the Cherokee Nation's newspaper) has an article about it that includes an image of the medal the Cherokee Nation made, in collaboration with the US Mint. It, too, uses the Cherokee syllabary. In twelve short pages, Boney conveys a lot of history. I enjoyed every word, and highly recommend his story. A curator at the Heard Museum Library purchased and printed it right away. He, too, found it exceptional. He catalogued it and put it on World Cat. If We Speak in Secret is an indicator of what we'll see in Tales of the Mighty Code Talkers: Volume I, we're all in for a magnificent treat. A bit more info about Roy Boney. He's a citizen of the Cherokee Nation. He does terrific work, much of it described on his website. Order and download your copy today from the INC website. *Post updated to include the character's name, written using the Cherokee syllabary, and the way it is pronounced.